Have you ever sat uneasily next to a talkative stranger at a function, only to find yourself mesmerised by their life story? Amazed by the crazy things they’ve done, dubious at their poor choices, and wincing a little when they shared a little too much intimate information? Katherine Boland’s memoir is just such a rollicking ride. And I have the feeling she’s never going to look back on her life and wonder if she should have chosen the road less travelled – she’s followed her heart rather than her head every time. After a childhood spent in England, Spain and rural Australia, Boland and her farmer’s son boyfriend dropped out of uni and followed their hippy dreams instead. They washed up in southern New South Wales, living a frugal alternative lifestyle replete with mudbricks and mung beans. This section of the memoir was the strongest, for me. Boland and her boyfriend (now husband – a seemingly un-hippy-like decision that the memoir remains silent about) live on their own property, in an area that is soon populated with similar peace and cannabis loving souls. Boland loves her life on the bush block near Bega but doesn’t step back from describing the difficulties: the distance from hospital; living quarters riddled with mould; and the endless backbreaking chores necessary in the absence of electricity and running water. And those other peace-loving souls are, it seems, just as subject to the darkness of family violence and abuse as the rest of the population. When a bushfire ends Boland’s 27-year marriage in an entirely unpredictable way, she retreats to the city and reinvents herself as an artist. She rapidly wins a number of scholarships and residencies, including one which takes her to Egypt. There she falls headlong and heedless into a loving relationship with her Egyptian translator – a handsome young man more than 25 years her junior. This second section of the memoir was weaker, for me, but perhaps only because I couldn’t help wanting to take Boland aside and shake her. What the hell was she thinking? Well, in the beginning at least it is abundantly clear what she was thinking (and feeling, and touching, and… you get the picture) and jolly good luck to her, I say. But to maintain a long distance relationship with a young Egyptian man in the face of fierce opposition from his family, and in the ever dawning awareness of the huge cultural gulf between them (not least about their respective attitudes about women’s rights and behaviours) was to my mind a step to far. But then what would I know? 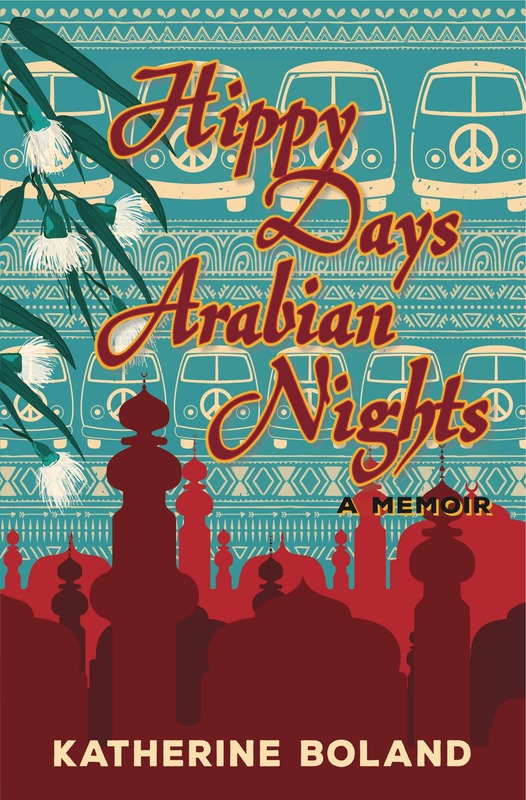 Hippy Days, Arabian Nights was a fun read, only slightly marred by the overuse of adjectives and a the under-use of a proofreader. Boland’s gutsy, funny and headlong approach to life makes for a fascinating memoir. Enjoyed this review Michelle, which I’ve read in entirety because I don’t expect to read the book. You’ve given me a great picture of it. Though I am interested in the unpredictable way her marriage ended so perhaps I should read the book. I’m glad she shared the difficulties. Whenever I get nostalgic about country living – and I know you do it – I realise I’m not up for the work (though I’m sure you at least have electricity and running water!!). I like my conveniences too much and just enjoy having friends who live in country places and invite me there. Haha, Michelle – even country-lite sounds like more than lazy me wants to do! I guess that says something about what sorts of things I really do enjoy. And, if you could be bothered, I’d be intrigued but you don’t have to you know! BTW I saw Nigel the other day and he remembered our connection. I just had to say, I knew one of his previous Hard Copiers and he knew immediately who it was!! Laughing now. That man is a treasure.